↑ Slaven, Dave. "What holds an atom together?". ↑ "Lavoisier's Elements of Chemistry". Elements and Atoms. Le Moyne College, Department of Chemistry. Retrieved 2007-12-18. ↑ Patterson, G. (2007). "Jean Perrin and the triumph of the atomic doctrine". Endeavour. 31 (2): 50–53. doi:10.1016/j.endeavour.2007.05.003. ↑ "Periodic Table of the Elements". The International Union of Pure and Applied Chemistry. November 1, 2007. Retrieved 2010-05-14. ↑ "J.J. Thomson". Nobel Foundation. 1906. Retrieved 2007-12-20. ↑ Stern, David P. (16 May 2005). 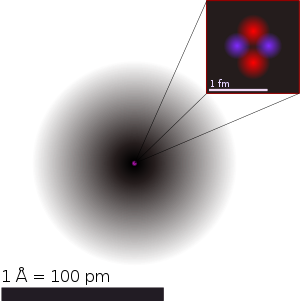 "The Atomic Nucleus and Bohr's Early Model of the Atom". NASA/Goddard Space Flight Center. Retrieved 2007-12-20. ↑ Chadwick, James (12 December 1935). "Nobel Lecture: The Neutron and Its Properties". Nobel Foundation. Retrieved 2007-12-21.